Paul Kummer lived about 60km north of Leipzig in the ancient town of Zerbst, in the Saxony-Anhalt region of Germany. There he had a varied career as a priest, a teacher, and a scientist with an intense interest in mycology. Nowadays Kummer's name appears throughout the taxonomy of fungi. Prior to Kummer's work most gilled mushrooms had been - Classified in a very small number of genera (Coprinus, Hygrophorus, Agaricus, and a few others) and in fact the vast majority of gilled fungi were simply recorded as Agaricus species. The great Swedish mycologist Elias Magnus Fries had subdivided groups of similar species within a genus into various 'tribi' or tribes, but it was with Paul Kummer's magnum opus Der Führer in die Pilzkunde, published in 1871, that many of the names we are familiar with today - Entoloma, Hebeloma, Pleurotus and Psilocybe, together with Friesian sub groups such as Clitocybe and Tricholoma for example - were promoted to genus status. Paul Kummer died in Germany in 1912. The abbreviation P. Kumm. is used to indicate Paul Kummer as the author when citing a botanical or mycological name. Paul Kummer worked as a private teacher in Zerbst, in Germany, from 1857 to 1863. Der Führer in die Pilzkunde : Anleitung zum methodischen, leichten und sichern Bestimmen der in Deutschland vorkommenden Pilze: mit Ausnahme der Schimmel- und allzu winzigen Schleim- und Kern-Pilzchen, 1871. Der Führer in die Flechtenkunde (Lichen-hunter's guide), 1874. Deutsche Blumenwelt in Charakterbildern, 1879. 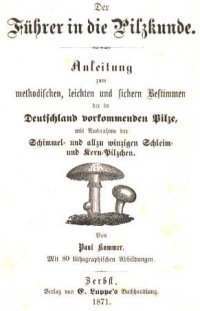 Praktisches Pilzbuch für jedermann (Practical mushroom-book for everyone), 1880. Der Führer in die Pilzkunde (Mushroom-hunter's guide) 2nd edition. 2 volumes, 1881 - 1884.